The beating heart of modern business and culture may be rooted in New York City, but the rest of the state cradles the Big Apple with classic Americana. Sweeping beauty, majestic mountains, Olympic spirit, and early American history is preserved in the Empire State. Here are the top 10 things to do in New York State for families. 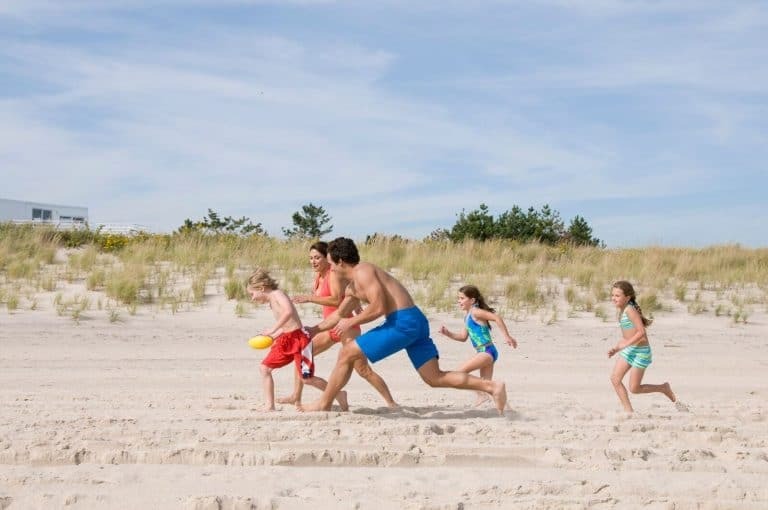 Stay at these family friendly hotels in New York. Baseball fans young and old love Cooperstown. 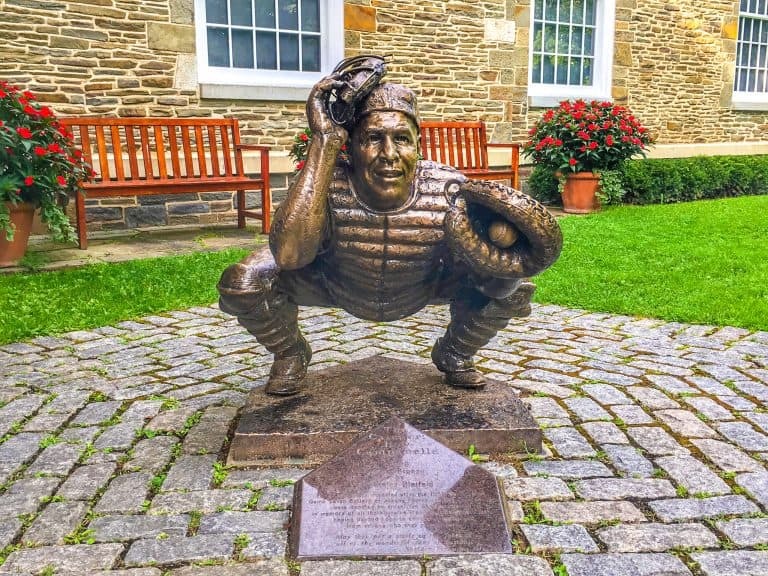 Set on an idyllic lake, The National Baseball Hall of Fame and Museum houses an extensive collection of baseball artifacts. Don’t miss exhibits on the women’s league and how African Americans contributed to our national pastime. I’m not a baseball fan myself, but every true fan that I’ve known has made their pilgrimage to this renowned museum! Also located in Central New York is the state’s second most popular year-round destination, Howe Caverns. Discovered in 1842, regular tours take visitors deep underground. Adventurous families can enjoy the experience the way cavern discoverer Lester Howe did — in the dark. On the Family Flashlight Tour adults are issued flashlights and children are outfitted with headlamps to make their way through passageways. The Strong Museum of Play is devoted to the study and exploration of play, even logging comprehensive research on the topic. 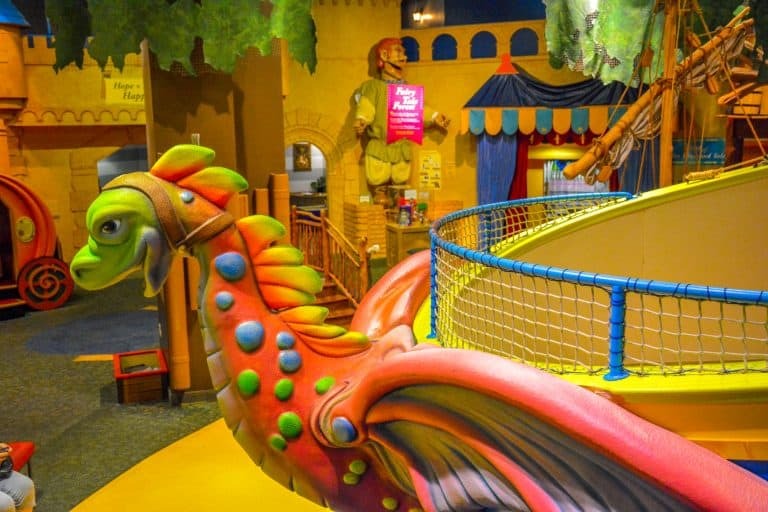 The National Toy Hall of Fame is housed here as well so that parents can reminisce with their favorite childhood dolls and video games as their children play in the 150,000 square feet of interactive exhibit space. Kids can leap into the world of Narnia and other favorite childhood story books, take a train ride, spin on a carousel, or spend time in the garden. 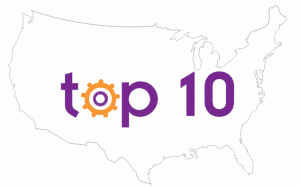 Check out Trekaroo’s Top 10 Things for Families to Do in Rochester. You’ll certainly be tired after playing all day! Find a place to rest your head in Rochester. Susan B. Anthony was one of the many activists who worked tirelessly to get a vote for women of the United States. She was even arrested for voting herself in 1872, decades before it became legal for women to vote. Did you know that Anthony and many of her fellow suffragists lived, worked, and met in Rochester and Seneca Falls? 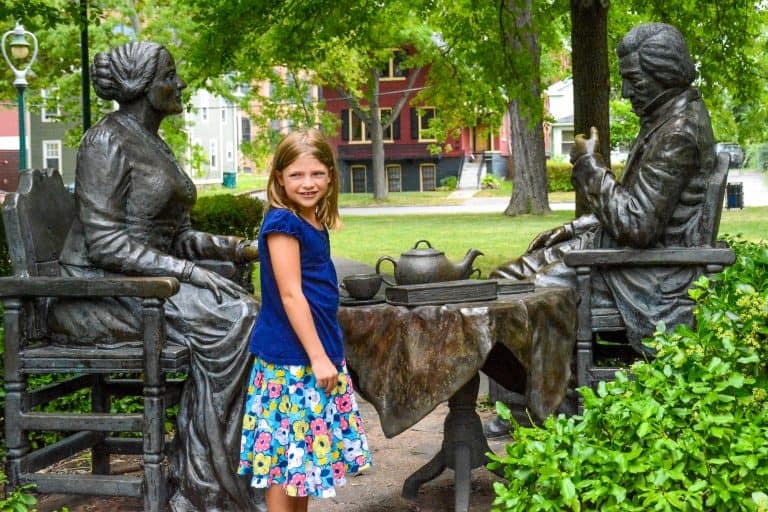 Families can tour Susan B. Anthony’s house, stroll through her neighborhood featuring a bronze statue of her drinking tea with fellow activist Frederick Douglas, and learn the story of the first Women’s Rights Convention held in Seneca Falls about an hour away. Today the national park service manages the Women’s Rights National Historical Park in Seneca Falls. The park educates the next generation about the struggle of women to achieve equal voting rights across America. 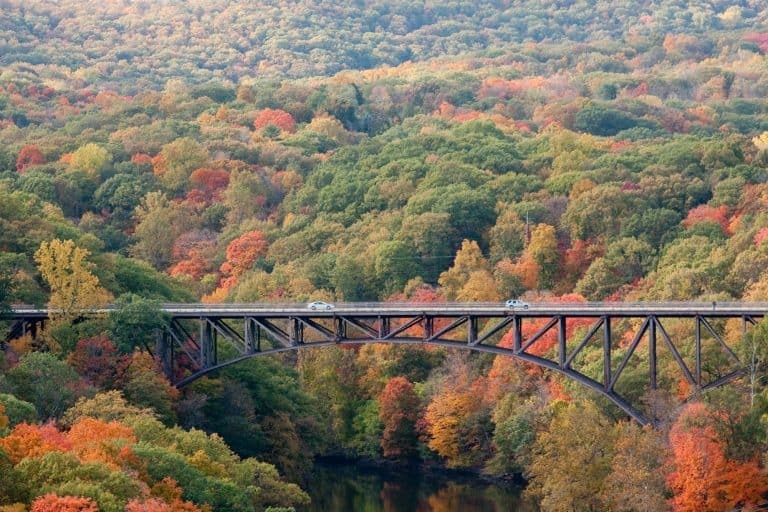 The beauty of the forest as the seasons change is richly complemented by history in the Hudson Valley. Views from Mohonk Mountain House are vibrantly colorful in the fall months. Families are surrounded by nature yet only 90 miles from the Big Apple. Both West Point Military Academy and the nearby Storm King Art Center are other essential stops for any fall road trip along the Hudson River. The view of the river from the campus of West Point is breathtaking. At the 500 acre world-renowned Storm King Art Center, families can walk outdoors among spectacular art sculptures. 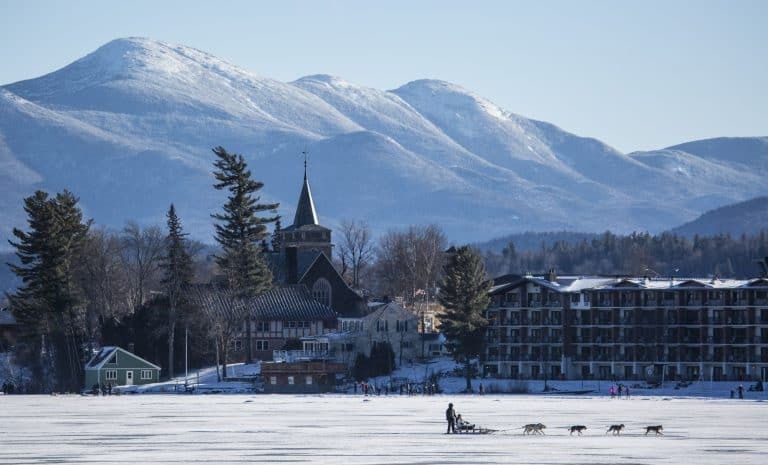 Lake Placid hosted not just one, but two Winter Olympics. There’s plenty around here to inspire visitors: watch historical footage of the 1980 Miracle on Ice at the Lake Placid Olympic Museum, glide around the Olympic Speed Skating Oval and where Eric Heiden won five gold medals and ride the elevator to the sky deck at the top of the 120m jump tower of the Olympic Jumping Complex. Olympic lore aside, there’s lots of beauty to behold in this area. Catch the Cloudsplitter Gondola at the Main Base Lodge and ascend to the top of Little Whiteface Mountain. With the Adirondacks laid out at your feet, all we can say is “Wow!” There’s even an observation deck and picnic area so pack a picnic and enjoy the scenery at your leisure. If your family loves a good road trip, don’t forget to drive the scenic Whiteface Veterans Memorial Highway. While the winding road has lookout points and picnic areas to breathe in mountain air and take in sweeping views, it’s at the “castle” where things really get adventurous. Are you planning to visit? Check availability at these hotels. 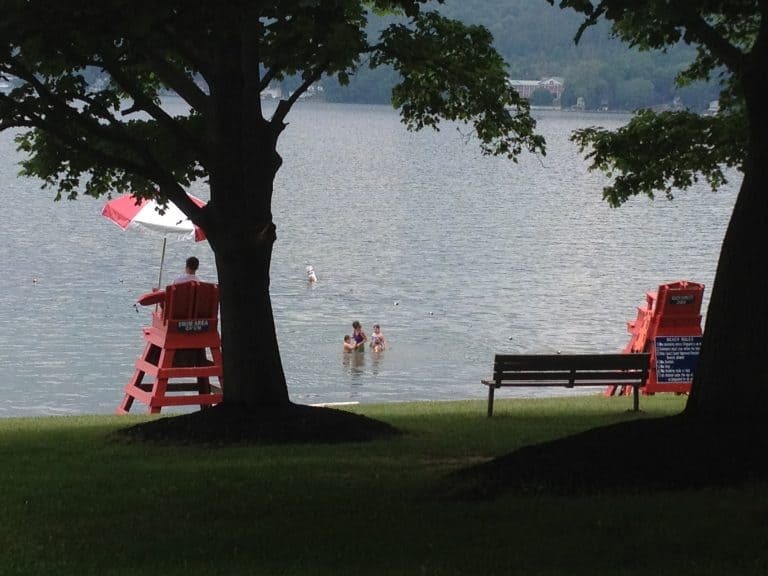 A summer week spent relaxing by the water is a tradition for many New York families. From pristine lakes of still water perfect for kayaking, swimming, and boating to streams, gorges, and waterfalls that beckon the more adventurous, this vacation destination has it all. Take a boat ride on Cayuga Lake, the longest of the Finger Lakes, or simply stroll through one of the quaint towns on its shoreline. While you’re in the region, be sure to stop at the Corning Museum of Glass. Part art museum and part science museum, the museum tells the story of the historic Corning Glass Works. Additionally, it shows off glass as art and illustrates how glass is used today. There are all sorts of demonstrations from how glass breaks to how it is made. Yes, this may sound like a disaster waiting to happen for families with little ones, but there are so many interactive things for kids to do that everyone has fun visiting the Corning Museum of Glass. 4. Hit the Beach on Long Island! While the Hamptons conjure up notions of swanky beach getaways for the rich and famous, there’s no reason your family shouldn’t be among them. Maybe pack a gourmet picnic and head to lovely Main Beach near the charming town of East Hampton. Or if you’d prefer something more low-key and casual, the surfer’s haven of Montauk is just twelve miles up the road. Perched on the furthest point in the Hamptons and surrounded by water on three sides, Montauk has six seaside state parks, a quaint village, and the historic Montauk Lighthouse to put visitors in a laid back state of mind in no time! For a more immersive nature experience, venture over to Fire Island National Seashore. The park staff runs a variety of programs to help kids and their families learn more about the park. Whether you sign up for a ranger-guided canoe trip, join in a seaside crafts and stories session, or go for your Junior Ranger badge, there’s a lot to explore in this park. Are you ready to shake the sand from your shoes? Learn some colorful area history on the Long Island Heritage Trail or pay a visit to Theodore Roosevelt’s Victorian home, Sagamore Hill. Honeymooners, barrel riders, and daredevil tightrope walkers may be the first things you hear about in conversations centering on Niagara Falls. But, there’s so much more to the daring draw of this force of nature. Get up close and personal with a Maid of the Midst Boat Tour. Operating since 1846, this boat tour was originally a ferry service between Canada and the States. After the service lost riders to the more convenient (and drier) Niagara Falls Suspension Bridge, it rebounded as a tourist attraction. Operating from late April/early May to October each year, a boat leaves every 30 minutes, traveling the Niagara River near Rainbow Bridge, past American and Bridal Veil Falls before disappearing into the dense mist of spray inside the curve of Horseshoe Falls, then emerging to bring patrons back to their starting points. 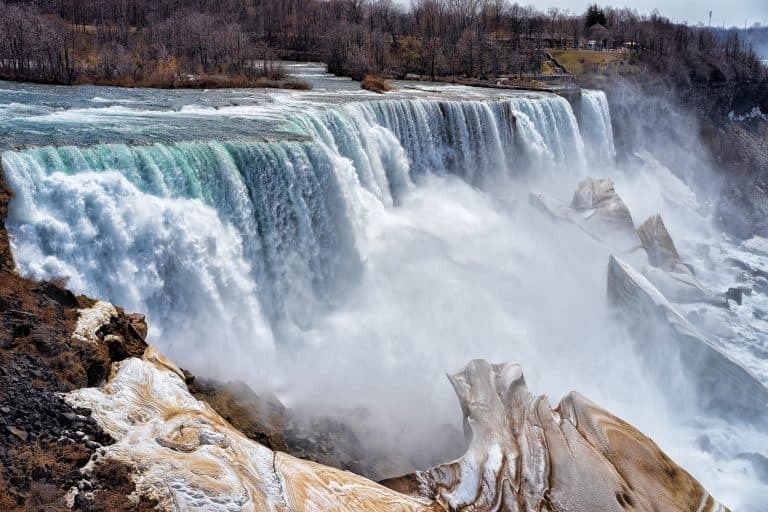 Meanwhile land lovers enjoy Cave of Winds Tour, an exhilarating walk into the mist zone where visitors navigate wooden walkways along the Niagara River to the Hurricane Deck where tropical storm-like conditions are created by the rush of the falls. But Niagara isn’t the only waterfall worth visiting in New York State! There are 180 state parks in the state of New York and many of the them feature spectacular waterfalls. Take a hike along the “Grand Canyon of the East” in Letchworth State Park. In just a couple of hours you can visit three amazing waterfalls appropriately named Upper Falls, Middle Falls, and Lower Falls (pictured above.) Of course, children love splashing along the gorge as they encounter waterfalls big and small at Stony Brook State Park, which even features a natural swimming pool with lifeguards in the gorge. New York City’s amazing collection of museums offer visitors exposure to art, science, nature, history, and more. The Guggenheim is a cylindrical-shaped building is seriously something to see. But as fascinating as its architecture is to the eyes, the building’s contents are even more so. A renowned collection of paintings reside here but before you decide nothing would bore your children quicker, the museum staff would like the opportunity to show you otherwise. Next, pick up a family activity pack at the museum’s information desk. Chock full of games, picture books, sketch pads, and artwork-specific question cards, your kids will leave with a higher art IQ and unaware they just spent the last few hours learning. Of course, the Guggenheim is not the only prestigious art museum in town, The Metropolitan Museum of Art houses a comprehensive collection of art spanning 5,000 years and representing the best of human creativity worldwide. From ancient Egypt to the Impressionist era, get ready for globetrotting adventure your children will never forget. 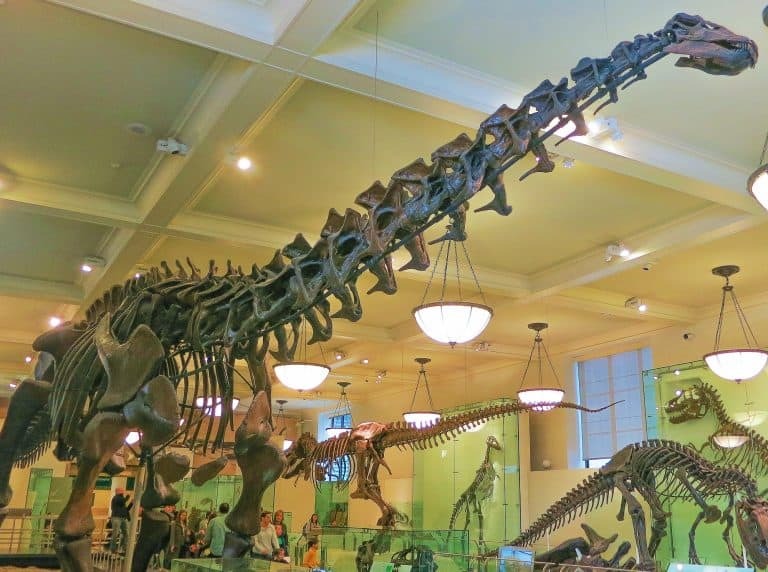 Also relevant is The American Museum of Natural History, which is a favorite New York museum for many Trekaroo families. This storied museum has been around since the 1869. Today, it covers 25 buildings housing exhibits featuring animal habitats, a full-sized model of a Blue Whale, and a planetarium. Then get a close look at a massive 31 ton piece of the Cape York meteorite and the largest sapphire in the world! Next, experience New York’s history at The Lower East Side Tenement Museum where actors bring the stories of a tenement apartment back to life in this living history tribute to the immigrants who settled in Manhattan’s Lower East Side. Visitors can interact with these true life characters, seeing firsthand the meager conditions they lived under after arriving in the U.S.
RELATED: Explore our Top 10 Things to do with kids in New York City. But no trip to New York is complete without a visit to the Statue of Liberty. 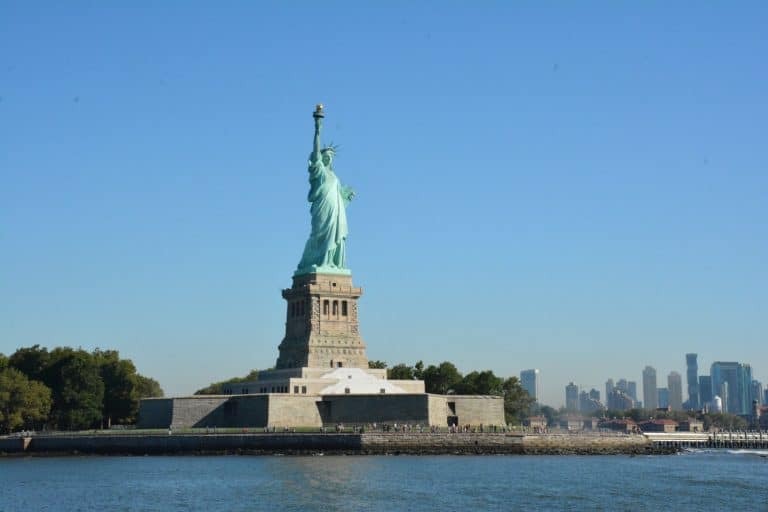 Recognizable to American kids of all ages, a visit to Lady Liberty is simply the most important place that families can visit on their visit to New York City. Together families can take a moment to reflect on their history and how they came to live in the United States of America, likely as immigrants in search of freedom and opportunity. Then, take in the view across the Hudson of the city skyline, complete a junior ranger booklet at this national park site and discuss your personal family history as you stroll around the island. Also noteworthy is a stop at Ellis Island, the point of entry for millions of immigrants coming to America by ship for over half a century. Looking for some tips on making the most out your visit to New York with kids? Check out Trekaroo’s Road School: An Immigration Tour of New York City.